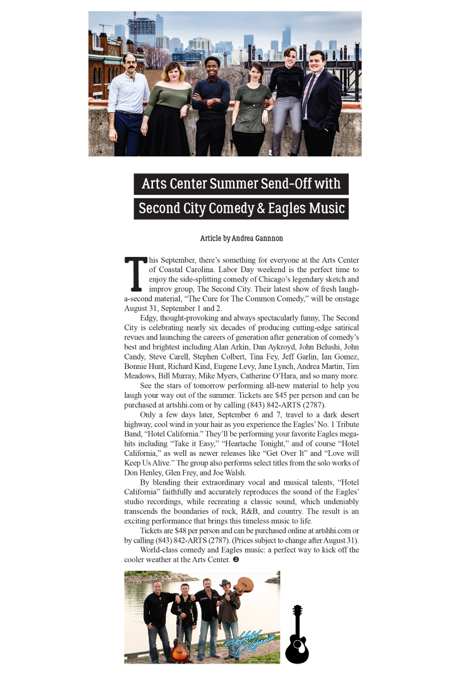 This September, there’s something for everyone at the Arts Center of Coastal Carolina. Labor Day weekend is the perfect time to enjoy the side-splitting comedy of Chicago’s legendary sketch and improv group, The Second City. Their latest show of fresh laugh-a-second material, “The Cure for The Common Comedy,” will be onstage August 31, September 1 and 2. Edgy, thought-provoking and always spectacularly funny, The Second City is celebrating nearly six decades of producing cutting-edge satirical revues and launching the careers of generation after generation of comedy’s best and brightest including Alan Arkin, Dan Aykroyd, John Belushi, John Candy, Steve Carell, Stephen Colbert, Tina Fey, Jeff Garlin, Ian Gomez, Bonnie Hunt, Richard Kind, Eugene Levy, Jane Lynch, Andrea Martin, Tim Meadows, Bill Murray, Mike Myers, Catherine O’Hara, and so many more. See the stars of tomorrow performing all-new material to help you laugh your way out of the summer. Tickets are $45 per person and can be purchased at artshhi.com or by calling (843) 842-ARTS (2787). Only a few days later, September 6 and 7, travel to a dark desert highway, cool wind in your hair as you experience the Eagles’ No. 1 Tribute Band, “Hotel California.” They’ll be performing your favorite Eagles mega-hits including “Take it Easy,” “Heartache Tonight,” and of course “Hotel California,” as well as newer releases like “Get Over It” and “Love will Keep Us Alive.” The group also performs select titles from the solo works of Don Henley, Glen Frey, and Joe Walsh. By blending their extraordinary vocal and musical talents, “Hotel California” faithfully and accurately reproduces the sound of the Eagles’ studio recordings, while recreating a classic sound, which undeniably transcends the boundaries of rock, R&B, and country. The result is an exciting performance that brings this timeless music to life. Tickets are $48 per person and can be purchased online at artshhi.com or by calling (843) 842-ARTS (2787). (Prices subject to change after August 31).